And for good reason, as the longtime Booger Bottom, Ga., hunting pro has tagged numerous white-tailed deer, Rocky Mountain elk, mule deer, pronghorn antelope, caribou, moose, and African big game before the cameras of Realtree Outdoors; Realtree Road Trips; and Bone Collector. Can you imagine the taxidermy issues that Waddell faces? As in "Dear Easter Bunny, this spring, fill my mailbox full of tags and let me have the taxidermy bill that Michael Waddell has." But long before Waddell was turning on his southern charm and chasing big antlers on camera, he was a self-described “redneck by the grace of God” and a spring turkey hunter who could, and still can, by the way, make a turkey call sing better than just about anybody in the land. In fact, Realtree’s Bill Jordan discovered Waddell a number of years ago after he won a turkey calling contest that the camouflage maker was a chief sponsor of. In other words, those longbeard wise-guys who strut their stuff, bellow out their love for all to hear and refuse to budge another inch into shotgun range no matter what brand of kitchen sink a hunter throws at them on that particular day. 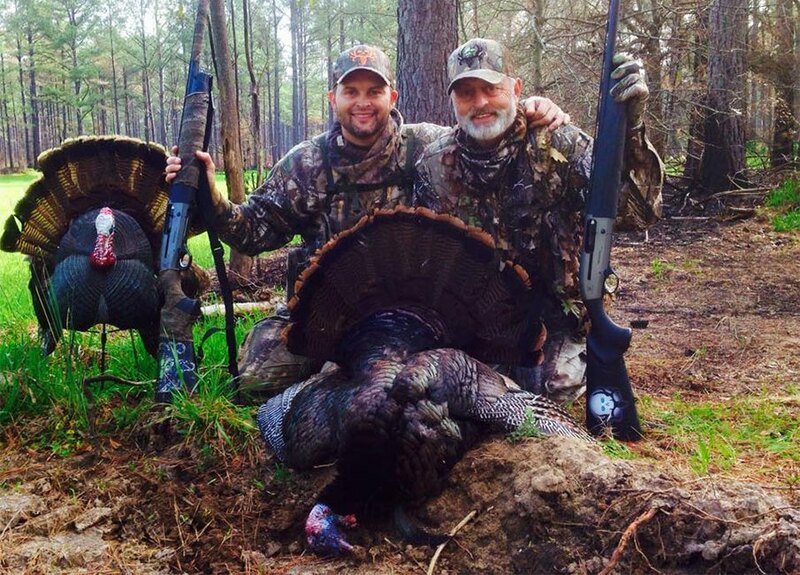 With a couple of decades of dealing with such hung up gobblers across the U.S., Waddell has learned some valuable strategies that he’s more than willing to pass along. Advice that he graciously passed along to yours truly when we both attended a fundraising dinner a couple of springs ago for the National Wild Turkey Federation, a gathering of the brotherhood down in Redneckville. Period. End of sentence. End of story. Pack it up and go home. Thunder chicken game over like a snake jacked up in a weed eater, right? Not necessarily. Waddell says that when a turkey hangs up like that, especially when a hunter is not using a decoy, one of several things is usually happening. “One is he (the gobbler) is really smart and he basically knows that there could be danger in the area,” said Waddell. What about when a hunter is using a decoy and the turkey still hangs-up? Waddell says that the pecking order of a local flock could be coming into play. So how do you get a hung-up turkey to advance those final few yards into scattergun range? This is to imitate the subtle sounds of turkeys feeding and moving semi-quietly through the woods. If the gobbler keeps strutting and doesn’t advance into range of a load of copper-plated #6’s, Waddell reaches even deeper into his bag of tricks. What if the bird still refuses an invite to the dinner table? Then the man from Booger Bottom pulls out one last trick. A trick that Waddell acknowledges is off-the-charts crazy according to most sound turkey hunting logic. One that should only be used when a hunter is tucked away safely on private ground and knows there is very little chance that he is going to be mistaken by an unknown hunter traipsing through the woods. "Completely crazy (I know) but a lot of times when that turkey is in the brush and he sees just a little movement, and it’s about tree level and not out in the open, he thinks ‘There’s that hen I’m looking for’ and that might bring him that 10 steps (into range). Waddell acknowledges that the move is counter to what most old-time turkey hunters would recommend. And that it should only be tried when a hunter is as certain as he can be that it can be done in a safe manner (in other words, NEVER try this on public land or land where numerous hunters are hunting). But sometimes this trick can be the last straw for that particular gobbler, one way or the other. And when the curse of hung-up turkeys looms large across the springtime landscape, that’s all you can ask for – that those wise-guy longbeards will take just another few more steps. So that the scattergun thunder can roll one more time through the springtime woods with a little bit of Waddell's famous call of "Shaka-Laka-Bam!" rolling in on the breeze.